Chateau / Country House1250 sq. ft. Original Homestead of the Cragin Family in 1906. This Historic 3-4 bedroom home has been completely remodeled with 2 full bathrooms. Private 32' fishing pier, Full kitchen, washer dryer, A/C, electric grill, outdoor fire pit, all towels & linens provided! We now have WiFi for our guests! Our 2 story home rests on a bluff 30' above the Southern shores of the new 2500 Acre Buffalo Lake! Our new $12M dollar dam is now complete! Bring your fishing poles and boat to our new launch ramps and dock at your own private pier in front of our house! With 2 huge cedar decks overlooking the property's 270' of private shoreline you are sure to relax in peace. Large campfire area off yard side deck. Bald Eagle, Great Blue Heron comb the shoreline. Beautiful sunsets and stars like you have never seen each night.Wood burning stove with ample campfire wood provided for those star filled evenings. Short 30 min drive to Wisconsin Dells/Baraboo attractions. Why stay in a crowded room/resort when you can have a whole private house to yourself for the same price! Yet just 4 miles to downtown Montello. Grocery, gas, bars, restaurants, movie theater, antiques, crafts, bait shop, boat rentals. Fully equipped kitchen with all appliances including pots pans silverware and plates. Pack light and come on over and relax! Master Bedroom fully carpeted, with spectacular view of lake & has new Verlo Queen size mattress. Huge 5' walk in shower with 2 smaller bedrooms on 2nd floor. Fully carpeted with all linens provided. All you need to bring is you! Bedroom 2 fully carpeted, has double Verlo firm mattress bed, dresser with TV/DVD in room with view of lake. Bed 3 has twin bed with extra twin mattress for extra guest along with TV/DVR combo and view of lake. Murphy bed room is fully carpeted with queen size Verlo firm mattress & dresser for clothes, just off 2nd floor bathroom with huge 5' walk in shower. Watch for bald eagle,geese & duck. Electric grill on deck ready for that quick burger or dog, no charcoal or propane to light. Less then 30 minutes away from the Wisconsin Dells Attractions without the crowds! Property on a bluff of the southern shores with many pine trees. Easy off road parking for 4 vehicles off street and room for trailer. Large decks to gaze those star filled nights, Beautiful sunsets off lake side deck to end your day. Why stay in an expensive, small, noisy hotel resort when you can have a whole quiet 2 story house to yourself! Keywords: Lake house with 270 feet private shoreline on the Southern shores of Buffalo Lake. Why stay in a crowded hotel resort when you can have your own quiet home! We have been enjoying our summer home since it has been completed with our children, family and friends. There is Drews Tavern at the Dam (great pizza & rib-eye sandwiches- Buffalo Lake Lodge on C has best BBQ ribs and buffalo burgers Granite Falls Supper Club in Downtown Montello near the waterfalls has all you can eat fish, chicken & ribs with all the fix-ens every Friday night The Chateau on RT23 & I39 has great homemade pizza & burgers. The 1800's town of Montello has restaurants, antique shops, ice cream parlor, taverns, water falls, movie theater, grocery, and Holiday mini mall. Only home on this stretch of Southern shores of Buffalo Lake! Hundreds of feet of private shoreline. sheets , pillows and blankets for all beds. Towels and wash clothes in both bathrooms along with toilet paper. wood burning stove with wood provided. New 10 cup we even have coffee and cups all you need! electric toaster oven if you hate soggy microwave food like me. griddle, crock pot, toaster oven, blender, toaster. New Hickory cabinets, original washboard sink, granite counter tops, stove, toaster, crock pot, dishes, pots and pans, glasses, coffee maker, utensils, napkins, salt pepper spices, coffee. 32' flat screen in living room with DVD player and HDMI hook up for kids games if needed. Bring a movie if you want but you didn't come here to watch TV did you? games and puzzles are available in dresser under TV. We have a horseshoe pit, Jarts and a soccer ball. There is a house stereo receiver you can hook your IPOD of MP3 player to and play your own music. one acre riverfront property has 270' of private shoreline. Quiet walk along the shore with lots of geese, ducks, eagles. 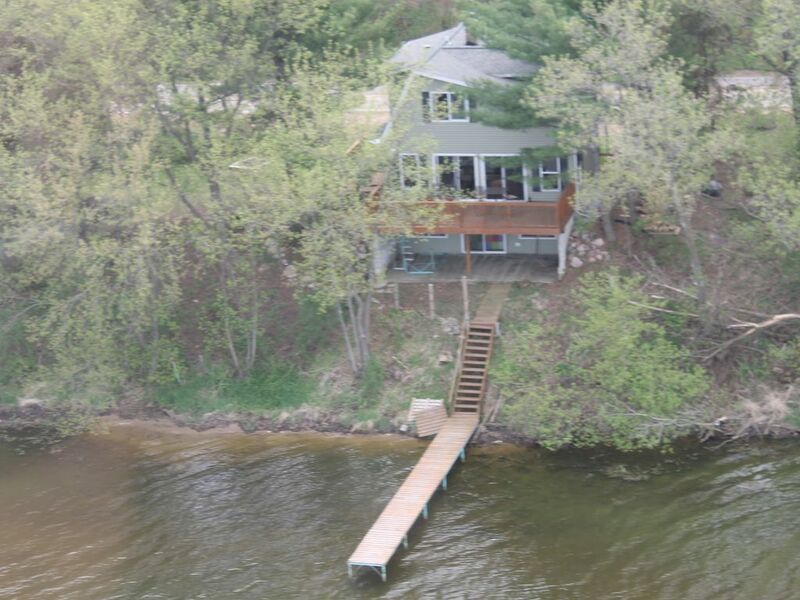 This 2 story home has been completely remodeled and has over 270' of private riverfront on the southern shores of Buffalo Lake near Montello, Wisconsin in Marquette County Wisconsin. Huge 25'X 10' cedar deck overlooks the lake and private 40' pier. If privacy is what you are looking for this is the place. Writing a review for this venue is depen on what you are anticipating. The cabin has had many updates and was very comfortable. The air conditioning is a portable unit and struggles to keep the cabin cool if it is hot. It was quite warm upstairs dueioour stay. The upstairs bathroom is beautifully remodeled. We also had mouse-sightings in the kitchen/dining room several times during our stay. The walk-way down to the lake needs to be taken with caution. People who are unsteady would not want to venture down to the lake. The lake had lots of algae and was not swimmable. If you are looking for a place where you can go in the water and enjoy water activities, this wouldn't be the place for you. Despite the mice, warmth and algae-covered lake, we did enjoy our weekend. We are glad you enjoyed your stay, guess the field mice found their way in for a snack again. Noting a couple of mouse traps won't fix. Our housekeeper said you left our home in excellent condition!. We look forward to you and your family staying with us again. The pictures and description of the property are not accurate. The climb down to the lake was terrible and slippery from the green slimy moss on the rocks. There was no fishing or swimming from the pier because it was so weedy and green. The house was 89° inside when we arrived. The description on the property said air conditioning....yes a portable unit upstairs that did not cool the downstairs at all. The running water smelt terrible and there was mouse poop on the dishes in the cupboards, in the stove and fridge. Also lots of little ants. One screen was ripped on the patio door so only one door could be open for fresh air. The wifi did not work, I contacted the housekeeper and nothing was done. After the stay the owner told me it was just a loose cable and now everything worked...wrong! The beds were not comfortable. The house was decorated cute and was a nice set up, but the owners could put some more money into the place then just their pockets. So quiet and peaceful on the shoreline. Very few boats on the water so not crazy during the day. Having 2 bathrooms was a plus. Also, Montello was a quaint little town just 5 minutes away with grocery, restaurants, bars, movie theater, antiques etc. Nice kitchen, great shower upstairs and lots of parking. We had a great time staying at this property. The house had enough space for 6 of us. It had everything we needed and then some extras. We played horseshoes and lawn darts everyday. We kayaked off of the dock, it was a little tricky getting down there but we just took our time and were very careful. The lake had a significant amount of algae, nothing that can be controlled by the owner, which made fishing a little tricky. However, we thoroughly enjoyed sitting on the deck everyday taking in the view and peacefulness of being right on the lake. The home and overall property are very well taken care of, there was plenty of firewood and great trees that we were able to hang hammocks in. Steve and Judy suggested a few places to visit in Montello and they were wonderful! This property is not very far from the Dells, we drove there one morning and were back by mid afternoon. We also visited Devil's Lake, which was amazing! We would definitely stay here again and we can not thank Steve and Judy enough for opening up their home. It was a much needed getaway. We are glad you enjoyed the peacefulness of the lakeside deck. The view alone can decompress you very quickly from everyday stress. We look forward to you visiting again next year. The family had a great time. Short 30 minute drive to Wisconsin Dells Area attractions Tommy Bartlet Water & Air Show, Noah's Ark Water Park, Lost Canyon, Devils Lake State Park, Circus World Museum, Ho Chuck Casino, Crusin' Chubby's, Wisconsin Duck Rides. Amish Village, Tahl Acres Golf Course. Just 3.5 miles away is the 1800's town of Montello where you can find Spark's Breakfast Restaurant, Granite Falls Supper Club, a full grocery store with a bakery and liquor store, antique shops, gas, tackle and live bait, movie theater & ice cream parlor. Downtown also has a beautiful waterfall, Friday Nights Granite Falls Supper Club has all you can eat fish, chicken & ribs for $11.95 you can't beat it. Best ribs in county at Buffalo Lake Lodge on County Road C, and fantastic pizza & Burgers at The Chateau on 23 &51. There is a movie cinema in town. Tahl Acres Golf Course/bowling is about 20 minutes north in Westfield.